" GA Sec. 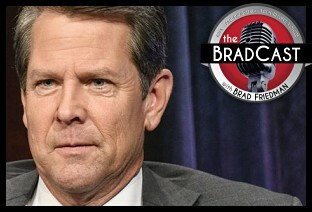 of State Kemp Falsely Reports Huge Voter Database Vulnerability as Dem Hack Attempt: 'BradCast' 11/5/2018	"
« PREVIOUS STORY "Sunday 'Fear Itself' Toons"
"GA Sec. of State Kemp Falsely Reports Huge Voter Database Vulnerability as Dem Hack Attempt: 'BradCast' 11/5/2018"
I fully expect MAJOR "red-shifts" on election night, wherever a GOPer wins in a race where they were previously behind or tied. Ofcourse, without raw exit poll data, the shift will be hard (or impossible?) to detect. But they WILL be there, in some areas, whether we detect them or not. THOSE DAMN TREES STILL FELL DOWN. But today's GOP is especially desperate not to lose on Nov 6th, in order to avoid accountability. 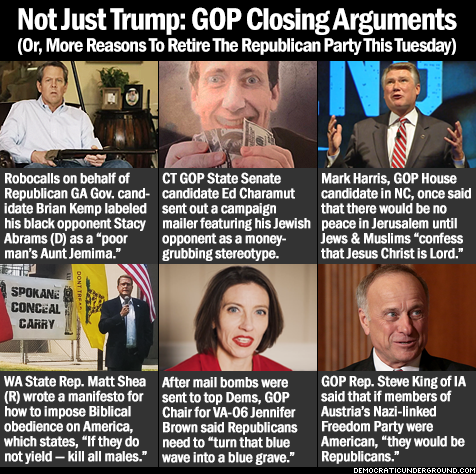 The GOP will risk more than usual, IMO, to win tuesday. Their operatives will be hard at work, out there in the darkness. the behaviors of the GOP. IMO, they will do whatever it takes to win. And this year, under Trump, they will be willing to do even more. Obama must have had absolutely gigantic majorities in 2008 and 2012, in order for the GOP to permit him to be elected, and back-off their fraud attempts. In 2018, the Dem majorities will have to be at least as large, or larger. When I see him speak about voting integrity on youtube, Bob Fitrakis sounds like he shares at least some of my cynicism. In any case, I am not alone. LOSSES for Gillum, Abrahms, Beto, and Ben Jealous. If san Diego uses touch-screen machines, then Anmar down in San Diego will lose as well. My pride is of no concern. You know my disdain for the Democratic Party's corporate-centrists. But I just feel the GOP is capable of anything right now. Anything to WIN. If cynicism is expecting a tick to drink blood, then color me cynical. The truth is, I feel pretty rotten about being right (i.e. GOP winning close races for key governorships plus Anmar's loss in SD). I see Wisconsin's Scott walker is in a virtual tie late in the counting in that key race. Agains, I predict Walker will pull-out a dramatic, super-narrow victory, as GOPers nearly ALWAYS do in these KEY situations. Nice to see Dems got their majority in the house, but that was predicted. Is there ANY "raw" exit-poll data out there, anywhere in America? Or, is that possibility gone forever now? By 2020 we will be at war with Iran, and Trump will sail to re-election as a "war president". Mainstream Dems will almost surely support any new military expenditures Trump wants. Honestly, I would far prefer to be wrong and a laughing-stock due to poor predictions. Well thank God I was wrong about something. Scott Walker is apparently OUT as Wisconsin Gov. That helps to wipe a few of the tears away. Also, Kobach lost in Kansas and the US House went D. There was much more to help wipe away those tears, amigo. Oh, and Abrams hasn't lost (yet).